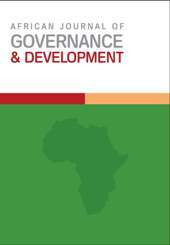 We present this issue of African Journal of Governance and Development against the backdrop of the recently released MDG Report of 2013: Assessing progress in Africa toward the Millennium Development Goals. The forward to this Report states that: “Africa must commit to inclusive, transformative development that reduces income poverty, creates decent jobs, enhances access to social services, reduces inequality and promotes resilience to climate-related hazards”. The Report notes that while Africa has made great strides towards reaching the Millenium Development Goals (MDGs) the continent’s low development has required more effort to make meaningful progress and that while Africa is the world’s second fastest growing region, its rate of poverty reduction is insufficient to reach the target of halving extreme poverty by 2015. For this reason, Africa must thus put structures in place to sustain its development well beyond the MDG timeline. It is not that Africa is poor on policies that would progressively lead to these ideals. Indeed, it is often said that government departments, while awash with good policy intentions, are always hamstrung by weak implementation of these policies leading to incessant policy failures. Institutional dynamics and health service delivery in regional referral hospitals in Uganda: What lessons from a case of Jinja Regional Hospital?